June 22nd was an amazingly proudly South African day. 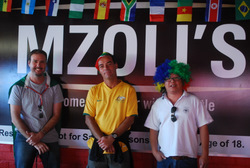 With overseas socceroos in tow from Australia, Mzoli’s Place in Gugs was our logical Cape Town destination to watch Bafana Bafana bow out of the World Cup in style. There are plenty of flatscreens around and the volume is always full blast. 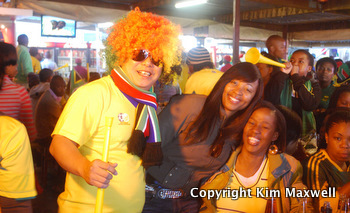 Our Bafana boys played incredibly passionate soccer, and the vuvuzela-blowing Guguthlethu contingent we joined were behind them with every cheer and roar. Arriving early to claim a Mzoli’s table is a good idea - our reservation had disappeared. 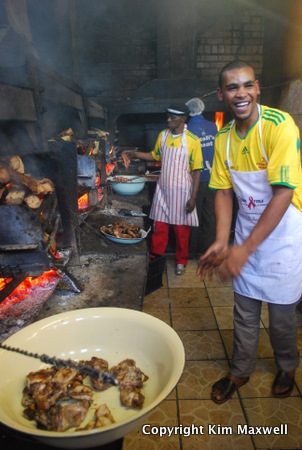 Like many township eating options, Mzoli’s is a butchery and operates on a seemingly chaotic system. Hundreds of people are fed braaied meat in a day so it somehow works. Weekends are generally packed to capacity. There are a few principles to remember at Mzoli’s: it’s cash only and drinks are ordered at the bar. Meat orders are placed with competent ladies inside in the butchery, after selecting your type and quantity of steak, pork, lamb chops, sausages and chicken. Specify if you want barbeque marinade (worth having), the required portions of mielie pap, spicy chakalaka of raw green peppers, onion and chilli – essential condiment – and mielie bread (we thought we paid for delicious-looking giant slices but the bread was finished when we collected our order). If you’re there for sport, hold on to your belongings whenever a goal is attempted because people are packed tight and the room reverberates. Bring tissues for the loo and ignore the lack of soap to wash your hands and you’ll manage just fine. Series of wood fires burn constantly in the grill area and the enamel bowls line up with numbered tickets of individual raw meat orders. People return periodically to nag the grillers that their table is still waiting, but patience is required – our order went in early yet we still waited about three hours for our braaied food. There were some tricky balancing moments while carrying food to the table through the seething masses pouring in the other way to watch their team. But the lamb chops and sausages in particular were charred to deliciousness. Despite the electric performance by Bafana Bafana resulting in the win that just wasn’t enough, there was no thought of heading home when the final whistle blew. South Africa may be out of the World Cup but townships know how to party and put smiles on faces. Women hopped up from their benches to tabletops as the deejay started spinning catchy beats. 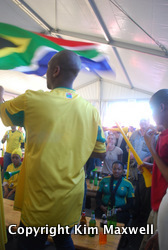 We put on a proud show – and my sporting visitors loved being part of a uniquely African day. Mzoli’s Place Near Ekhaya corner store, Gugulethu, Klipfontein Road M10 exit from N2. Tel 021 638 1355.